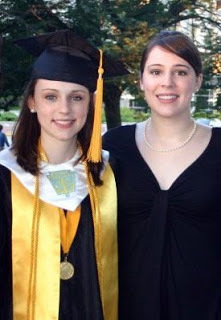 This is my little sister, Jane, at her high school graduation two months ago. Look at all those cords and awards! (That rhymes.) Okay, you're right; I'm in the picture, too. Ignore me for now. But, uh oh, this is my little sister, Jane, in the ER last Saturday. I know, right!? Jane, being on Codeine and still feeling the effects of the Michael Jackson meds Demerol that they gave her before they extracted the needle (! ), did not feel like herself, to say the least. So she and I decided that making this rainbow cake from Omnomicon would cheer her up! Here are our adventures in colorful-cake-making, photo-documented for your viewing pleasure. Yum, and it definitely did taste good! I want to try it again sometime soon. Maybe shades of pink on the inside?